Is your duct tape wallet not quite big enough to hold your various treasures? Try something a bit bigger! This duct tape tote is waterproof, and perfect for carrying around whatever you’d like. If you’d like to decorate it a bit, simply buy some crafts to decorate until it’s to your satisfaction. You can also adjust the size of the bag by changing the size of the measurements. -Be careful with the knife. Make sure you’re cutting away from yourself, in case you slip. -When you’re cutting the tape off of the paper, be careful not to cut off a part. 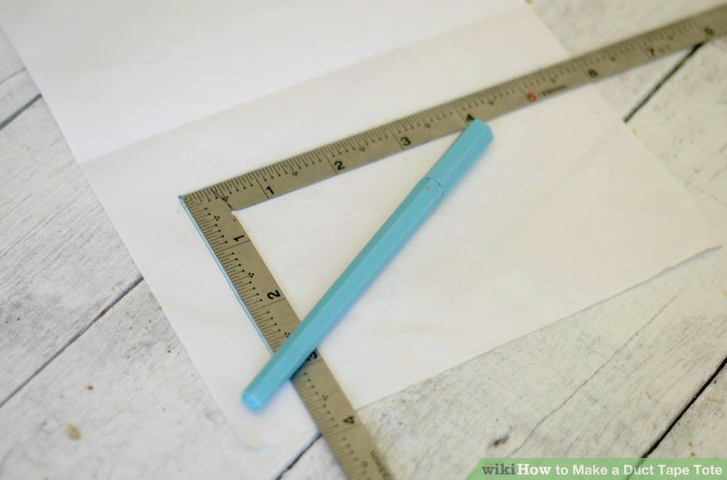 Step 1: Make the bottom of the purse by drawing a 5.5 inch by 3 inch (14cm by 7.6cm) rectangle on a piece of paper. Apply duct tape to the back of the paper rectangle. Cut out the rectangle. 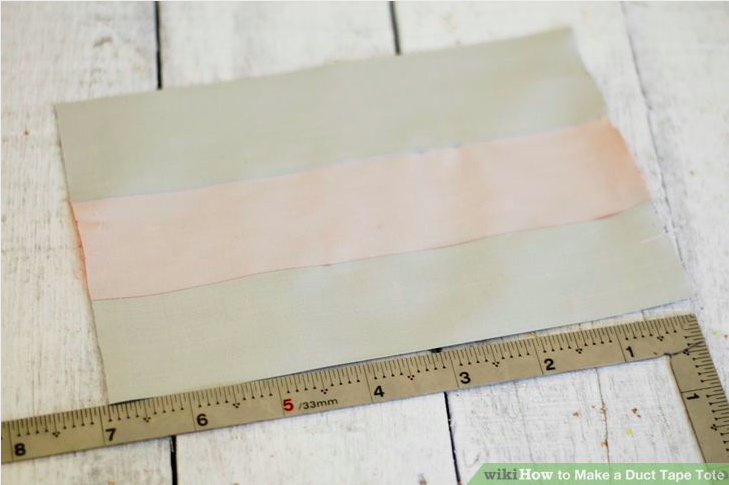 Step 2: Line the outside of the bottom of the purse by applying duct tape to the back (paper side), leaving at least 1/4 inch (.6cm) of the sticky part showing. 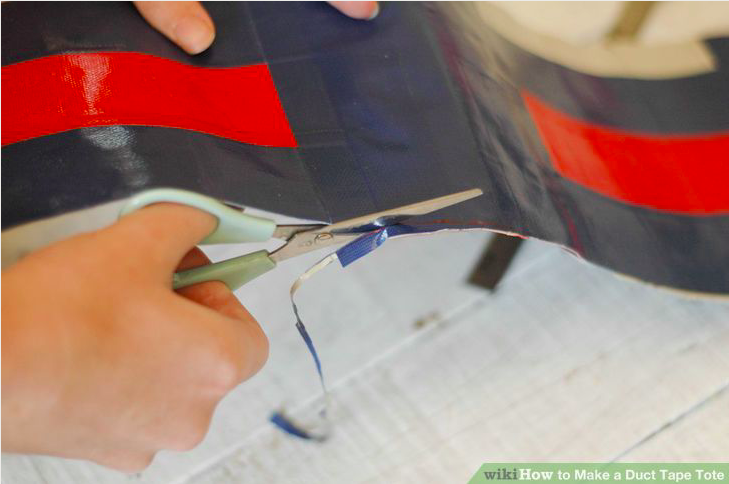 Step 3: Make two long sides by making two 7 inch (17.75cm) long duct tape fabric (laying duct tape out and overlapping the edges to form a piece of duct tape) of 3 pieces of duct tape. 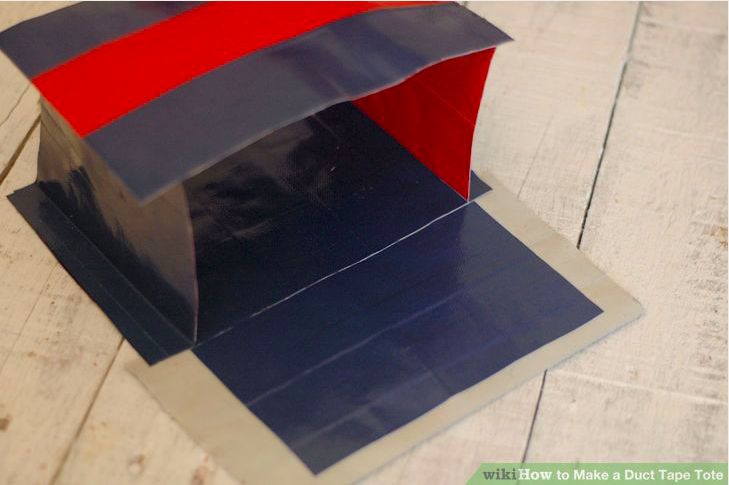 Step 4: Tape the inside color of duct tape over the outside pieces, sticky side to sticky side, in a perpendicular direction. You will need to leave at least a .25 inch (.6cm) part of the sticky tape showing on one end. 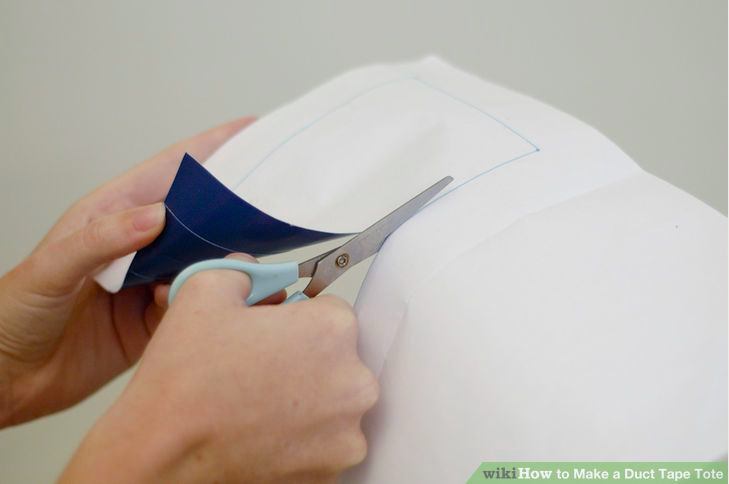 Use the bottom to mark with a pen how wide the inside should be. 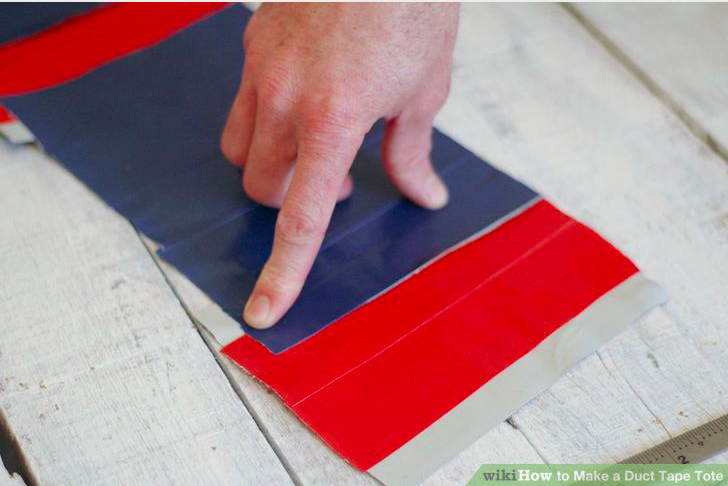 Know that if you place the two sides next to each other as you apply the inside color of tape, you can cut them apart when you are finished. 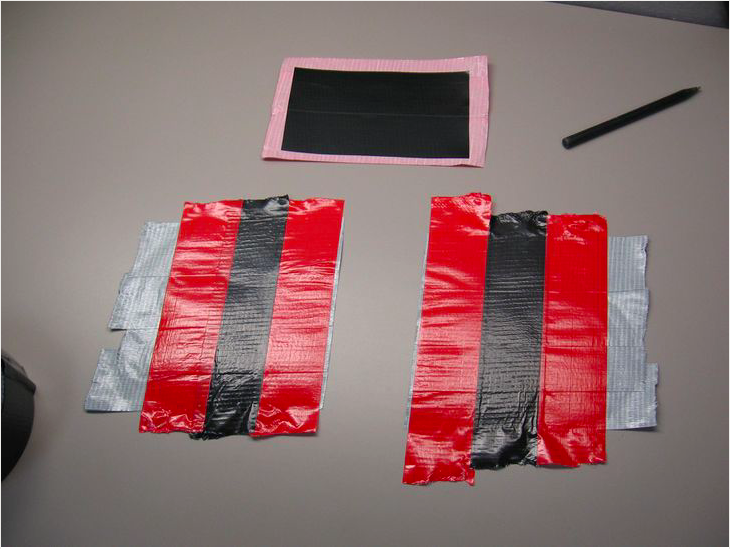 Step 5: Make two narrow sides by making a 5.5 inch (14cm) long by 3 pieces wide fabric of duct tape with the outside color. Use the bottom template to mark with a pen how wide the inside should be. Apply the inside color leaving at least 1/4 inch (.6cm) sticky part showing on the long sides. Step 6: Fit the sides together matching up the inside tape and sticking together with the exposed sticky parts. Step 7: Trim the top and bottom of the purse to be straight. Trim the sides of the purse leaving 1/8-1/4 inch (3-6mm) sticking out. Step 8: Attach the sides to the bottom of the purse. This can be a bit tricky. Start with one long side, laying it next to the inside bottom. Press onto the exposed sticky part of the bottom. Repeat for each side until it is attached. Trim the corners of the bottom so that the sides will stick out again. 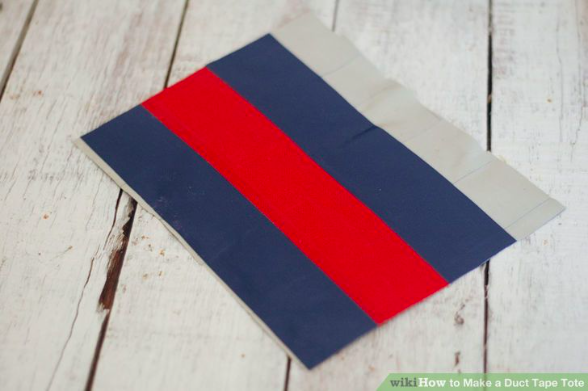 Step 9: Make handles for the purse by folding a piece of duct tape into thirds. 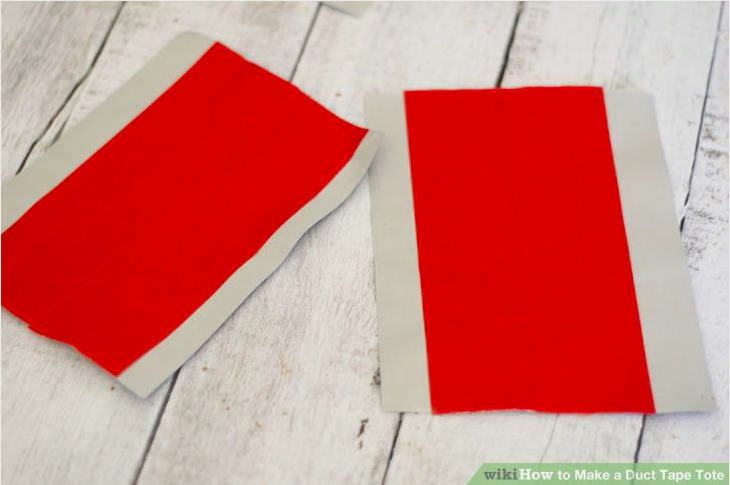 Attach these to the purse with a strip of the inside color of duct tape. So there you are! Carry around your schoolbooks, use it for collecting rocks, or simply to organize your room a bit more. You can find a great selection of colored duct tape, metallic duck tape, camo duck tape, and even glow-in-the-dark duck tape at jmcremps.com. If you want even more fascinating and fun Duct Tape Projects, check out our e-book series called Warfare by Duct Tape. The easy-to-follow instructions will allow any creative kid (or adult) to create swords, armor, shields, and more! The instructional portion of this article was provided by wikihow, a wiki building the world’s largest, highest quality how-to manual. 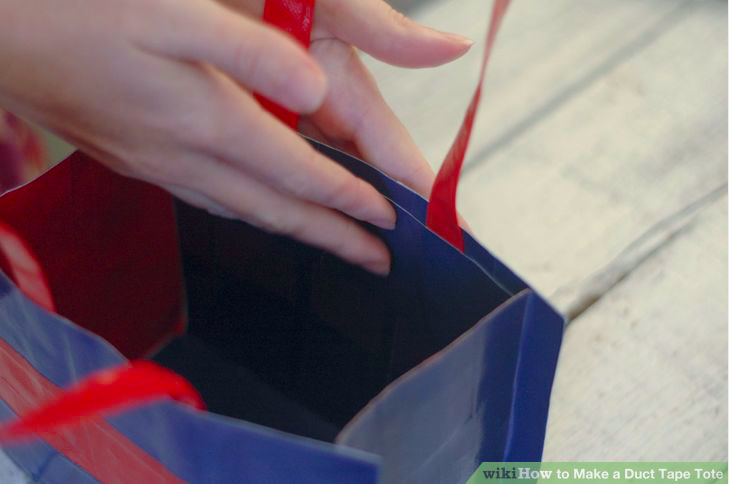 Please edit this article and find author credits at the original wikiHow article on How to Make a Duct Tape Tote. Content on wikiHow can be shared under a Creative Commons License.